With so many anime series broadcast each season, it’s a shame that few are fondly remembered even two years after their debut. It speaks volumes about The Ancient Magus’ Bride however, that despite its late debut in a year that featured My Hero Academia and Attack on Titan, the dark fantasy has remained a favourite. So it’s an even bigger shame that a truly great series has received a disappointing release. An orphaned girl plagued by supernatural spectres and her traumatic past, when Chise Hatori puts herself up for auction without a care of who buys her or why, she attracts the attention of one peculiar buyer. With a tall robe, a goat skull head, and a £5 million cheque signed for the red-head, Elias Ainsworth is neither entirely human or fairy. He is however, one of the last few practising mages, who wishes to make Chise his apprentice and more, as the title implies! Transported to Elias’ rural home in the West of England, Chise accompanies the mysterious mage as they encounter a myriad people and creatures from British folklore. Through these adventures, the young girl who was once resigned to throwing her life away will witness many different perspectives of life and death, and realise the different ways beauty can be hidden beneath the darkness of the world. One such meeting that remains in my mind is with the elderly dragon Nevin. His wings are rendered flightless by age and his eyes without sight, yet he is it at peace with what the younger dragons around him excitedly await – for his body to sustain the life of a new tree. 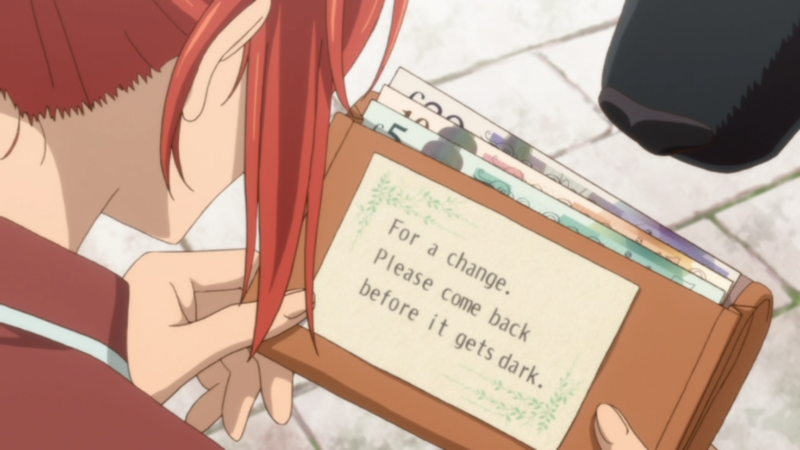 In another example, Chise must help a dog come to terms with the loss of its human. It’s a real testament to The Ancient Magus’ Bride’s thoughtful writing that such a fantastical series can put something as real as life and death into perspective. Much as I felt when watching the cast of K-ON! The Movie walk through Camden Town tube station or enter a Waitrose, I was delighted to see even small details of Great Britain, like train station interiors, the newer £5 note (although they were slightly off with the size of the £20! ), and the design of police cars, recreated in animation with delicate accuracy – I was even amused by the sight of fish and chips on Elias’ table! This contrasts with Princess Principal’s more simply assembled version of England, which simply transferred aspects of Japanese culture, like confession letters in school lockers. The passion that original manga author Kore Yamazaki has for Great Britain isn’t just skin-deep however, with the frequent visitor finding ways to incorporate it into almost every aspect of the original story. The Ancient Magus’ Bride’s dive into our culture’s ancient history is sure to prove an insightful lesson even for learned Brits. Anglo-Saxon paganism inspires a lot of the fairy lore for example, and the Fairy Queen Titania’s distaste for the priest Simon is born from Christianity’s takeover of Britain’s former dominant faith. It was also enchanting to see stories I heard growing up inspire major parts of the series, like the Church Grim spectral dog that guards churchyards, a commonly told tale in my home county of East Anglia. There’s simply too many nods to our folklore to list, but did you know that Elias’ unusual head was inspired by the Mari Lwyd – a Welsh custom? With animation by Wit Studio of Attack on Titan fame, it won’t come as a surprise to hear that The Ancient Magus’ Bride is absolutely gorgeous. Lush and vibrant colours elevate the already idyllic image of the English countryside to new heights, and spectacles like the shimmering scales of an underwater dragon or flowers blooming under a starry sky are beauties to behold. There are major reasons to avoid the DVD that I’ll go into shortly, but the visual upgrade alone is worth investing in the high definition Blu-ray. Praise also has to be given to Hirotaka Kato’s work in infusing Yamazaki’s original character designs with the bold colours and flair expected of a major TV anime production, while also staying faithful to the manga. On the musical front, Junichi Matsumoto’s first composition credit brings a few enchanting pieces that fit thematically with the series’ inspiration of the British Isles. While these were powerful the first time I heard them, they are re-used so frequently that their impact lessened each time. “Iruna Etelero”, an insert song performed by the character Lindel, is at the centre stage of an especially magical moment towards the end of this volume. The English language dub produced by Funimation Entertainment made a fortunate choice that Sentai’s Princess Principal did not: that no accent is better than a bad accent. Instead of focusing on The Ancient Magus’ Bride’s English setting, the American cast rightly prioritised character, even if the dub still doesn’t always hit the mark. Chise Hatori is a complicated role and one I don’t envy any performer taking on. Her painful past experiences and outlook are carried wonderfully by Atsumi Tanezaki in the original Japanese audio, but Dani Chambers’ performance unfortunately comes across as more apathetic. However, Brian Mathis quickly grew on me as the enigmatic Elias, and I found Stefan Brönneke’s Renfred was a better fit for the character than Satoshi Hino. I was less impressed with some of the supporting cast though, with Jason Douglas turning the wise old dragon Nevin into a generic grumbling monster, and Rachel Michelle Thompson showing nowhere near the level of emotion seen in Kikuko Inoue’s brief appearances as Chise’s mother. The lack of emotion is an issue that permeates this dub, which I found to blunt the impact of the original. The English dub isn’t bad; it just feels serviceable at best, and the original Japanese audio remains my preferred option. 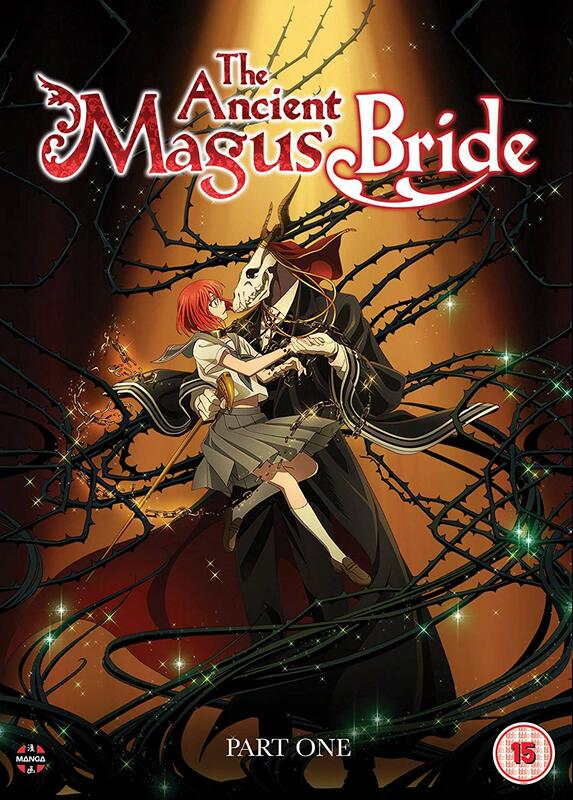 The DVD release of the series unfortunately features no bonus content at all, with the small number of extras, and the more significant three-part OVA prequel The Ancient Magus’ Bride: Those Awaiting a Star being exclusive to the Blu-ray release (and is notably only available in Japanese with subtitles). Manga UK clarified with us that this configuration is due to the release sharing materials used for Funimation’s US release, and later sent us Blu-ray materials so I could also review the OVAs. Turning back the clock to tell a story from Chise’s troubled childhood, where the young girl stumbles upon a magical library hidden in the woods, the OVAs are easily the best episodes in the set. Watching an eight-year old Chise being shunned by her extended family for the strain her care placed on them, to finally finding solace in the escapism of reading, really helped further my understanding and empathy for Chise. With their events being briefly referred to in the series as well, I’d go as far as to say that any release is incomplete without them. The DVD releases has other problems as well. Having used them for my main viewing (being supplied the Blu-rays later on for the OVAs), I noticed a number of banding and similar issues, some of which caught my eye even when watching from across the room pictured below. Note Ruth’s left shoulder). So all things considered, I really can’t recommend buying the DVD version of this release. If you have a Blu-ray setup however, and wish to explore a heartfelt dark fantasy full of British charm, than The Ancient Magus’ Bride is sure to enchant you. The Ancient Magus’ Bride Part One is available now on DVD and Blu-ray, courtesy of Manga Entertainment UK. Manga Entertainment UK confirms delays to two upcoming anime home video releases: The Ancient Magus’ Bride Part 1, and the hip-hop co-production film MFKZ.